The Crown Heights-based bagel shop Nagle's Bagels is opening in three new locations, including this storefront at 50 Lincoln Road in Prospect-Lefferts Gardens. CROWN HEIGHTS — Get ready for a lot more bagels, Brooklyn. A year after opening on Franklin Avenue in Crown Heights, Nagle’s Bagels is planning to expand to three other locations in the area, including a Bedford-Stuyvesant store that opened this week. The bagel and sandwich store — run by Michael de Zayas, proprietor of several Crown Heights businesses including Hullabaloo Books, Two Saints cocktail bar and Linden Salon — opened last February on Franklin Avenue directly next to de Zayas’ coffee shop, Little Zelda. Now, the Nagle’s name is on its way to Nostrand Avenue and Lincoln Road in Prospect-Lefferts Gardens, the shop announced on its website. A fourth shop opened this week at 378 Tompkins Ave. in Bedford-Stuyvesant, according to The Bed Stuy Blog, right next to the recently-closed coffee shop Common Grounds. Work is ongoing at the new Crown Heights spot, 630 Nostrand Ave. near Dean Street, according to Brooklynian.com contributors, but as of now, no "Nagle's" signs have yet appeared on the planned store at 50 Lincoln Road near Flatbush Avenue in Prospect-Lefferts Gardens. 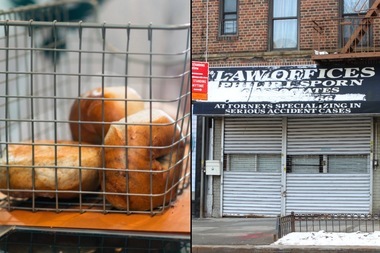 The new shops are joining a growing market for bagels in the neighborhood; in addition to Lula Bagel, established since 2013 on Nostrand Avenue and Lincoln Place, business is booming at the Park Slope-based Bagel Pub, which opened on Franklin Avenue and St. Johns Place in December.